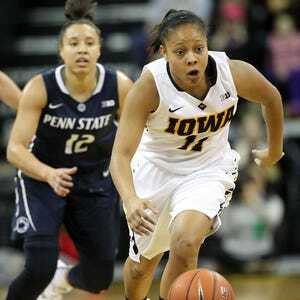 Before conference play kicked off in late December, Lisa Bluder said it would take at least nine Big Ten wins for her young Iowa squad to reach the NCAA Tournament. Entering the final two weeks of the regular season Bluder still believes in her nine-win benchmark. The Hawkeyes will need to be perfect the rest of the way to reach that goal. Iowa (15-11, 5-9 Big Ten) needs four straight wins to close out the regular season to pull its Big Ten record to .500. According to Bluder there is a chance Iowa makes its ninth straight NCAA Tournament appearance with an 8-10 Big Ten record. Four straight wins to end the season and a 9-9 conference mark would make Selection Monday a whole lot easier for Bluder. Iowa enters the final four games of the Big Ten season firmly on the NCAA Tournament bubble. The Hawkeyes have lost four in a row after Monday’s 78-76 loss at Minnesota and have dropped to 10th in the Big Ten standings. Iowa believes it can finish the season with four straight wins in a stretch that includes three home games, beginning with Thursday’s meeting with Purdue (16-9, 7-7). While Iowa’s tournament resume has certainly taken a hit during its current four-game losing skid, the Hawkeyes still find themselves firmly in the NCAA Tournament conversation. Charlie Creme of ESPN had Iowa as one of the first four out in his updated Bracketology on Tuesday. Iowa still has an RPI of 57 and with home games remaining against Purdue and Indiana, two teams ahead of Iowa in the Big Ten standings, it has a chance to climb the conference ladder. More than half of Iowa’s losses this season, including three during its current four-game losing skid, have come to teams in the RPI top 50. Now Iowa needs to win in the conference. If Iowa can close out the season with four straight wins over Purdue, Indiana, Penn State and Illinois, the Hawkeyes would put themselves in a position to possibly secure a bid with a strong showing at the Big Ten Tournament. The first step comes Thursday against Purdue.